I love the golden color of Bronze. 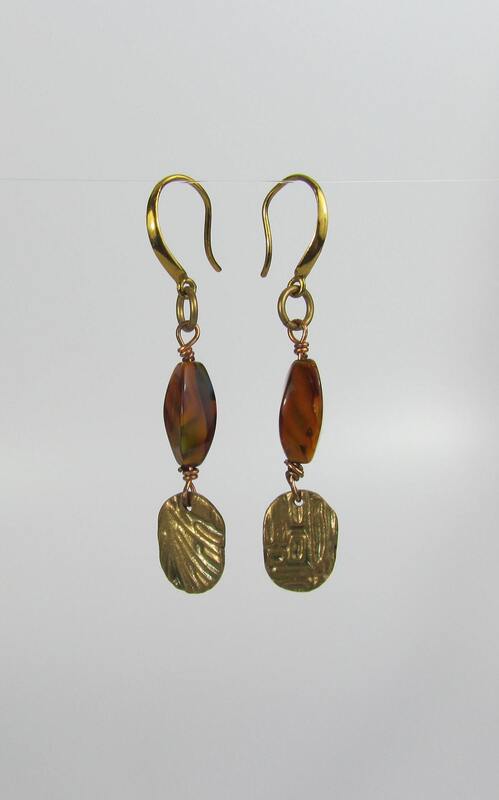 I hand sculpted and carved the beautif dangles on these unique abstract earrings using BronzClay that after firing in the kiln becomes solid Bronze. 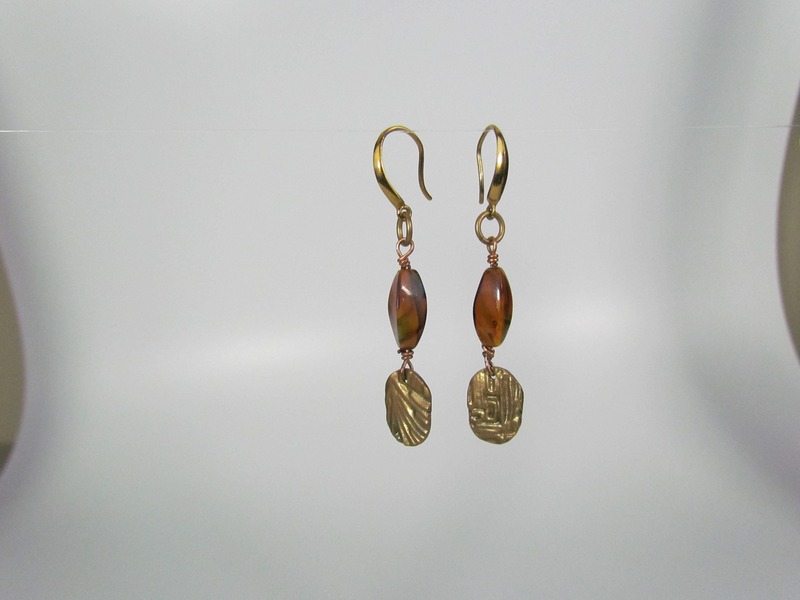 I added beautiful brown glass beads and Bronze earring hooks. I can substitute surgical steel hooks however the color will be silver for the hooks by doing so. 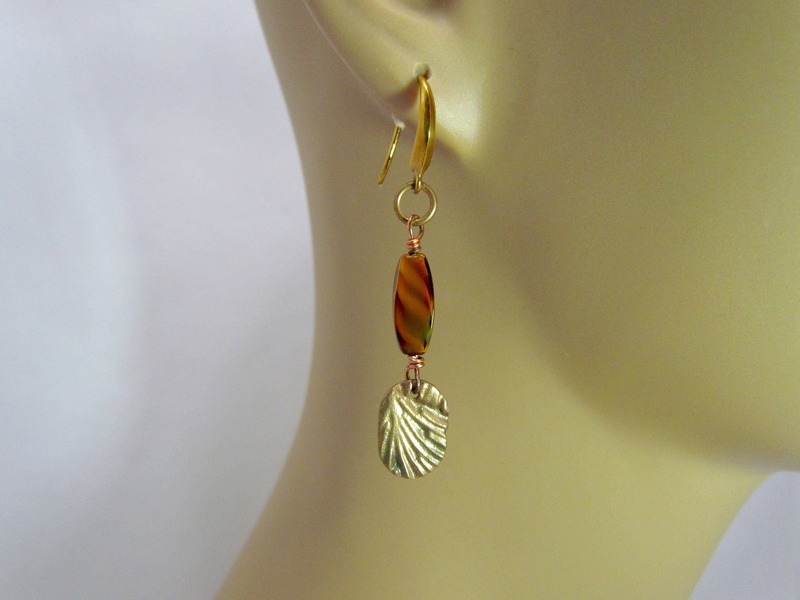 These extremely lightweight earrings have a dangle length of 40mm and are 9mm wide at the widest part. For holidays I am offering holiday themed gift wrapping for $2 with a hand written name tag or personal message. I can offer all holiday wrapping including Birthdays, Anniversary, Christmas, etc. Be sure to leave me a note for which holiday wrapping you desire if it is not for Christmas. At no additional charge I package all items in beautiful boxes with ribbons. Unless you wish to wrap with specific paper yourself, you can present the item in the original packaging as I also make sure there are no price tags on the item itself. These gift wrap options allow you to have the gift sent directly to the recipient. You should never use liquid silver cleaner. LIQUID silver cleaner is very harsh and can harm the metal over time as well as remove any patinas that were put on the piece intentionally. Body oils, hairspray, perfume, makeup...just to name a few...can cause Sterling to tarnish so use mild soap and water to clean the piece after wearing. Everyone's body chemistry is different and some people can wear sterling for years without tarnishing it. I personally have high acid content so I can tarnish a chain around my neck in one day. The best way to remove tarnish is with a Moonshine Jewelry Polishing Cloth. I will be offering these for sale in the future.